Mix together the agave, vegan butter, vanilla extract, and salt. Then gradually add in all of the powdered sugar, It will make this very sticky thick goo. Add in food colouring if using. Melt the chocolate chips in a double boiler. Then follow the instructions for method 1 or method 2 as desired. Use a spoon to drop some chocolate into each egg shape, and push it up to cover the sides. Flip over the mold and shake out the excess chocolate onto parchment paper. Flip the mold back over and use a spatula or back of a knife to scrape off the excess chocolate. Place the mold upside-down onto a parchment lined baking sheet and pop it into the freezer for 15 to 30 minutes to set until the chocolate is completely firm. Heat your oven to 200F (90C), and heat an oven-safe plate in the oven. Once the chocolate is set, pop the chocolate eggs out of the mold. Take your creme filling out of the freezer and scoop some up. Form an egg shape that will fit into your chocolate egg, then pop it in one half of the egg. Be careful not to make the filling too big or you won’t be able to stick the two chocolate sides together. Take the warm plate from the oven, and press the second half of your chocolate egg onto the plate to melt the edges of the egg. Then simply lightly press the filled egg half together with the melted edge egg half. Boom! Gorgeous professional looking vegan chocolate creme egg. Repeat with all of the remaining eggs and filling. METHOD 2: Forming the eggs by hand. Form egg shapes with the frozen creme filling. Pop the egg shapes back into the freezer to set again. 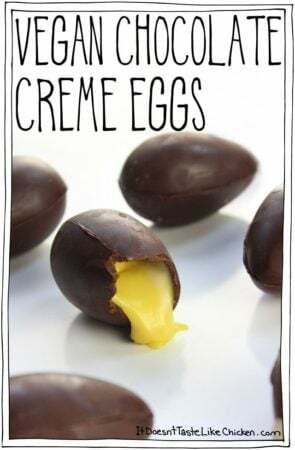 One at a time, drop the frozen creme eggs into the melted chocolate. Use a spoon in each hand to cover the creme egg with chocolate, then scoop it out shaking off the excess chocolate, and place on parchment-lined baking sheet. Repeat until all of the creme filling and chocolate is used up. Pop the baking sheet in the freezer to set. The only trick here is to make sure the creme filling is solid and to work quickly coating them in chocolate as they can get a bit melty. Work in small batches to help avoid any melty messes.